Kids who read independantly at school are more likely to: find reading important, enjoy reading, and read more frequently. 97% of parents of kids ages 0-17 agree that every child deserves a school library. 65% of kids ages 6-17 have the chance to read independently during the school day. 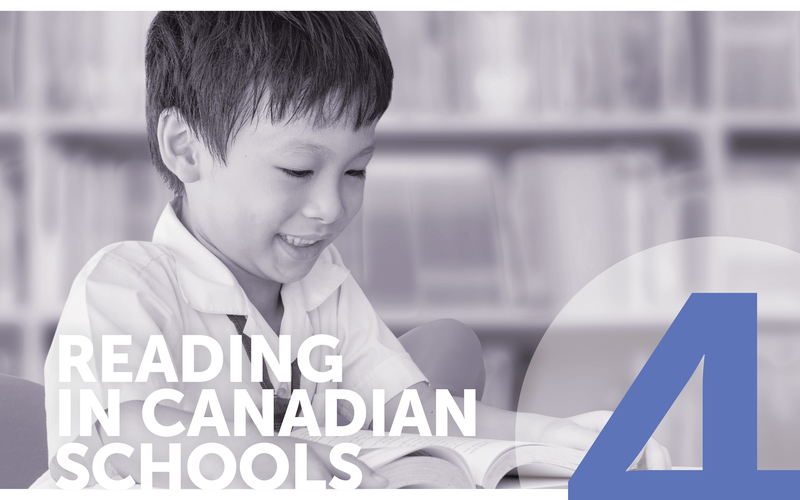 68% of kids ages 6-17 say that reading independently is one of their favourite parts of the school day, or that they wish they could do it more often at school. Where do kids get the best ideas for finding books to read? 50% of kids feel that talking to their peers (friends, siblings, cousins, etc.) is a helpful way to find the best books. 49% of kids feel that asking their teachers or school librarians is a helpful way to find the best books. 32% of kids feel that trying out the school book club or going to school book fairs are helpful ways to find the best books. Summer reading is important and fun, be a reading role model! Parents are kids #1 source of encouragement to read books for fun, according to 82% of kids. 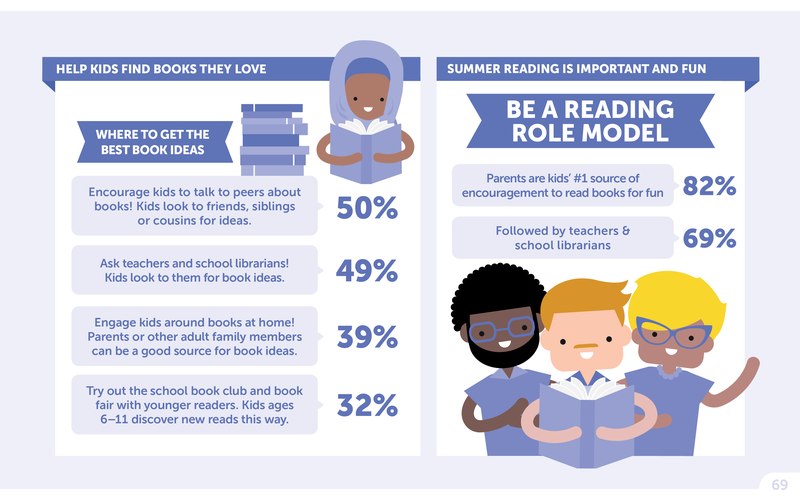 Teachers and librarians are also hugely influencial in encouraging kids to read for fun, with 69% of kids claiming that they encourage them to pursue the activity. 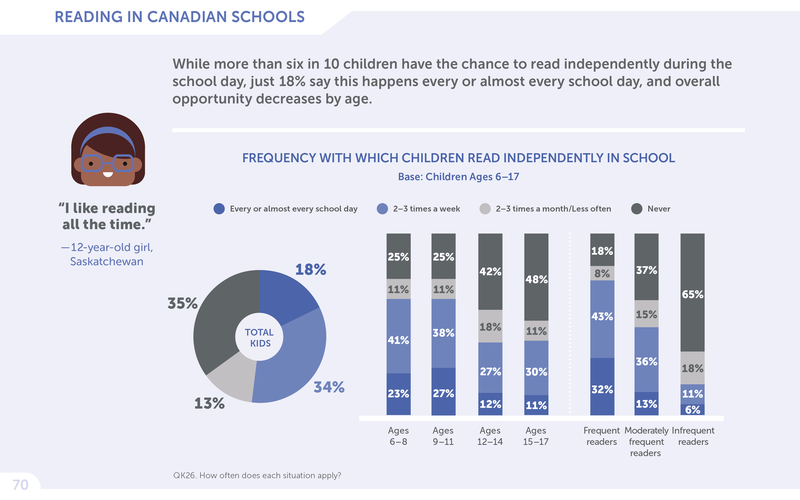 While more than six in ten children have the chance to read independently during the school day, just 18% say this happens every or almost every school day, and overall opportunity decreases by age. A base of children of ages 6-17 were asked about the frequency with which they had the opportunity to read independently in school. In total, 18% of kids reported that they were given time to read independently every day or almost every day at school, 34% said they were given time 2-3 times a week, 13% said they were given time 2-3 times a month or less, and 35% said they were never given time to do so. Looking at kids of ages 6-8, 23% reported that they were given time to read independently every day or almost every day at school, 41% said they were given time 2-3 times a week, 11% said they were given time 2-3 times a month or less, and 25% said they were never given time to do so. Looking at kids of ages 9-11, 27% reported that they were given time to read independently every day or almost every day at school, 38% said they were given time 2-3 times a week, 11% said they were given time 2-3 times a month or less, and 25% said they were never given time to do so. Looking at kids of ages 12-14, 12% reported that they were given time to read independently every day or almost every day at school, 27% said they were given time 2-3 times a week, 18% said they were given time 2-3 times a month or less, and 42% said they were never given time to do so. Looking at kids of ages 15-17, 11% reported that they were given time to read independently every day or almost every day at school, 30% said they were given time 2-3 times a week, 11% said they were given time 2-3 times a month or less, and 48% said they were never given time to do so. Of all children considered to be frequent readers, 32% reported that they were given time to read independently every day or almost every day at school, 43% said they were given time 2-3 times a week, 8% said they were given time 2-3 times a month or less, and 18% said they were never given time to do so. Of all children considered to be moderately frequent readers, 13% reported that they were given time to read independently every day or almost every day at school, 36% said they were given time 2-3 times a week, 15% said they were given time 2-3 times a month or less, and 37% said they were never given time to do so. Of all children considered to be infrequent readers, 6% reported that they were given time to read independently every day or almost every day at school, 11% said they were given time 2-3 times a week, 18% said they were given time 2-3 times a month or less, and 65% said they were never given time to do so. An open ended response from a 12-year-old girl from Saskatchewan on reading: "I like reading all the time." Few children read for an hour or more during independent reading, most read for less than 20 minutes. 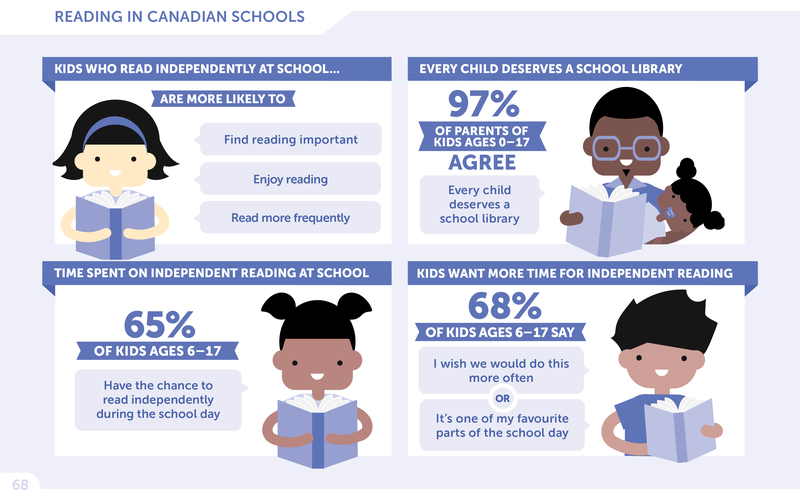 A base of children of ages 6-17 were asked about how long they usually read for when given a chance to read a book of their choosing independently at school. In all, 52% of kids asked said they would read for less than 20 minutes when given a chance to read independently, 44% said that they would read for 20-59 minutes, and 4% said they would read for an hour or more. Looking at children from ages 6-8, 58% said they would read for less than 20 minutes when given a chance to read independently, 40% said that they would read for 20-59 minutes, and 2% said they would read for an hour or more. Looking at children from ages 9-11, 58% said they would read for less than 20 minutes when given a chance to read independently, 38% said that they would read for 20-59 minutes, and 4% said they would read for an hour or more. Looking at children from ages 12-14, 49% said they would read for less than 20 minutes when given a chance to read independently, 45% said that they would read for 20-59 minutes, and 7% said they would read for an hour or more. Looking at children from ages 15-17, 36% said they would read for less than 20 minutes when given a chance to read independently, 59% said that they would read for 20-59 minutes, and 5% said they would read for an hour or more. For kids of all ages considered to be fequent readers, 52% said they would read for less than 20 minutes when given a chance to read independently, 43% said that they would read for 20-59 minutes, and 5% said they would read for an hour or more. For kids of all ages considered to be moderately fequent readers, 50% said they would read for less than 20 minutes when given a chance to read independently, 47% said that they would read for 20-59 minutes, and 3% said they would read for an hour or more. 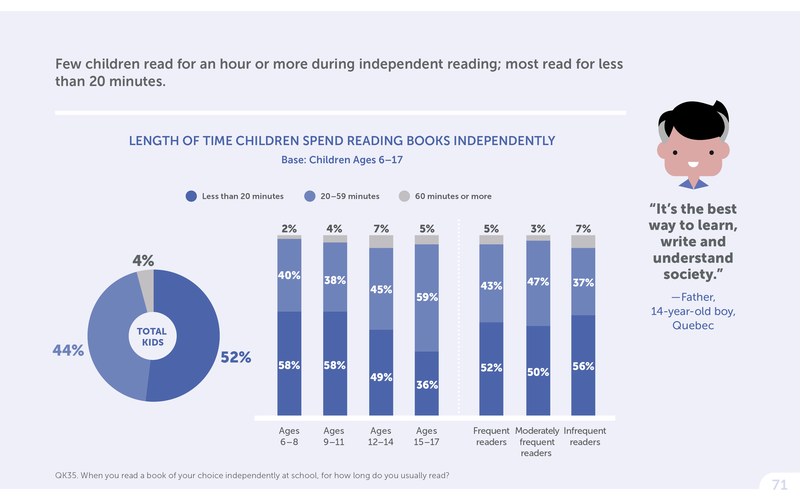 For kids of all ages considered to be infequent readers, 56% said they would read for less than 20 minutes when given a chance to read independently, 37% said that they would read for 20-59 minutes, and 7% said they would read for an hour or more. An open ended response from a Father of a 14-year-old boy from Quebec on the importance of reading: "It's the best way to learn, write, and understand society." Kids, especially 6-11 year old, enjoy independent reading time in school. 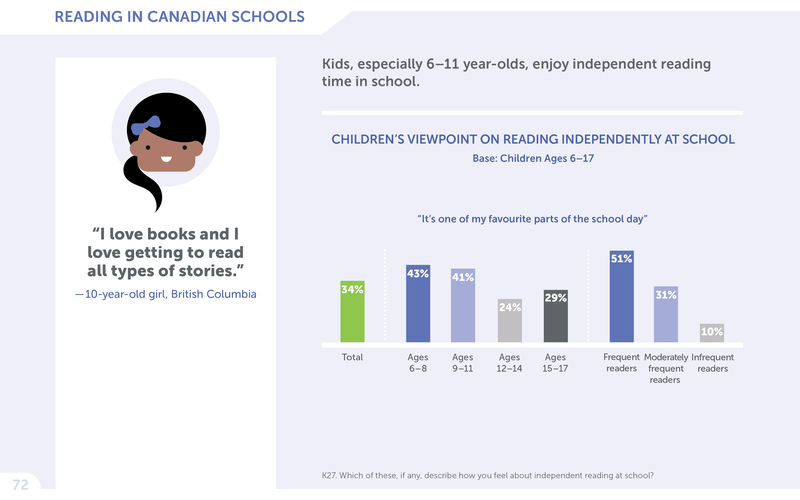 A base of children of ages 6-17 were asked whether they agreed with the statement: "Independent reading time is one of my favourite times of the day." In total, 34% of kids from all age groups agreed with the statement. For children of ages 6-8, 43% of kids asked agreed with the statement. Of children from all age groups that were frequent readers, 51% agreed with the statement. Of children from all age groups that were moderately frequent readers, 31% agreed with the statement. Of children from all age groups that were infrequent readers, 10% agreed with the statement. An open ended response from a 10-year-old girl from British Columbia on reading: "I love books and I love getting to read all types of stories." Four in ten kids want more time for independent reading in school. A base of children of ages 6-17 were asked whether they agreed with the statement: "I wish we would do independent reading more often." In total, 42% of kids said that they agreed with the statement. Of kids ages 6-8 asked, 43% said that they agreed. Of kids ages 9-11 asked, 46% said that they agreed. Of kids ages 12-14 asked, 44% said that they agreed. Of kids ages 15-17 asked, 37% said that they agreed. Kids of all ages who read frequently agreed with the statement 43% of the time. Kids of all ages who read moderately frequently agreed with the statement 49% of the time. Kids of all ages who read infrequently agreed with the statement 20% of the time. 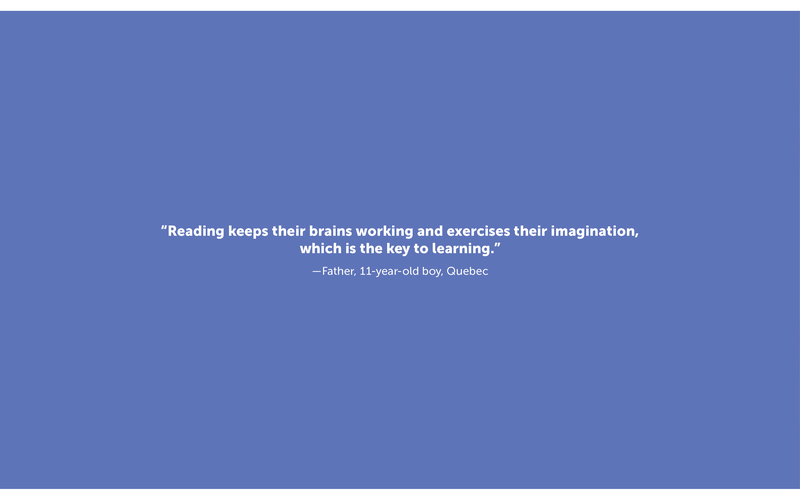 An open ended response from a 7-year-old boy from Manitoba on the importance of reading: "Reading is interesting. I get to learn and understand new things." Kids who read independently are more likely to find reading important, enjoy reading and read more frequently. A base of children of ages 6-17, some of whom having previously read independently at school, and some of whom not,were asked whether they agreed with a series of statements and questions about reading, with the results from each group differing from eachother significantly. When asked whether they would say that it is extremely/very important to read books for fun, 77% of kids who have read independently at school agreed, whereas only 49% of kids who have not read independently agreed. When asked whether they would say that they love/like reading books for fun, 75% of kids who have read independently at school agreed, whereas only 55% of kids who have not read independently agreed. 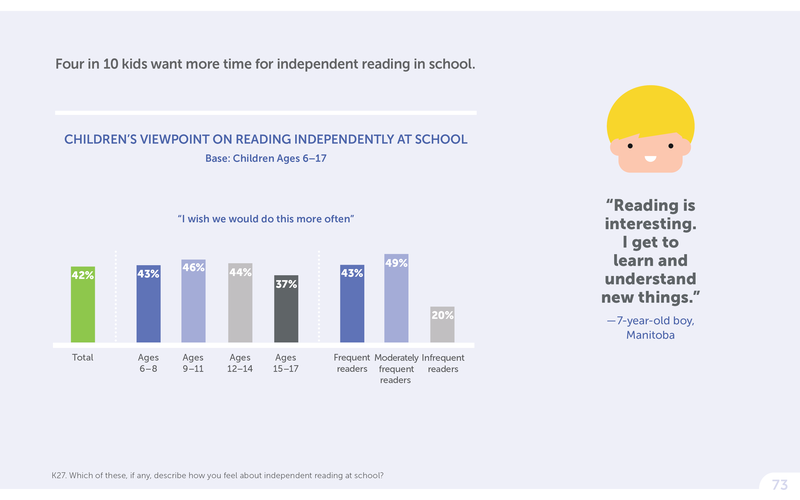 When asked whether they were frequent readers (reading 5-7 days a week), 43% of kids who have read independently at school agreed, whereas only 17% of kids who have not read independently agreed. When asked whether they were currently reading a book for fun, 61% of kids who have read independently at school said that they were, whereas only 37% of kids who have not read independently said that they were. When asked whether they choose to read in their free time, 70% of kids who have read independently at school agreed, whereas only 45% of kids who have not read independently agreed. When asked whether they thought that books had inspired them to believe in themselves, 82% of kids who have read independently at school agreed, whereas only 66% of kids who have not read independently agreed. On average, kids who read independently at school read 28 books in the last year, whereas kids who do not read independently at school only averaged 13 books read in the past year. An open ended response from a Father of a 16-year-old boy from Ontario on the importance of reading: "Reading keeps his vocabulary fresh, and his imagination sharp." Parents agree that every community needs public libraries. A base of parents of children ages 0-17 were asked about the degree to which they agreed or disagreed with the statements: "Every community needs to have a public library", and "Every child deserves to have a school library". In all, 96% of parents agree that every community needs to have a public library, with 72% agreeing strongly, 25% agreeing somewhat, and 3% disagreeing somewhat. In all, 97% of parents agree that every child deserves to have a school library, with 73% agreeing strongly, 24% agreeing somewhat, and 3% disagreeing somewhat. An open ended response from a 9-year-old boy from Ontario on reading: "I love reading books and going to the library."